Miguel Olivo joins the Dodgers, TIm Federowicz optioned to Triple-A as Dodgers shuffle catchers. The Dodgers have had some wiggle room with their roster for at least a couple weeks now. From the time Chad Billingsley exited his first (and still only) rehabilitation start on April 6, it’s been less and less likely that the right-hander would return within the first two months of the season. Wednesday, the Dodgers formally acknowledged that fact. Billingsley was transfered to the 60-day disabled list and the Dodgers selected the contract of catcher Miguel Olivo to the 40-man roster. Rather than continue to stash Olivo in Triple-A Albuquerque, where he’s batting .390 with four home runs and 18 RBIs in 15 games, the Dodgers recalled Olivo and optioned catcher Tim Federowicz to Albuquerque for the second time this season. Olivo, 35, hasn’t appeared in a major-league game since June of last year with the Miami Marlins. He showed well in spring training, batting .263 (5 for 19) in nine games as a non-roster invitee on a minor-league contract. When he was returned to the minors, Olivo requested his release. Ultimately Olivo bid his time at Triple-A and was rewarded for his patience. Federowicz was batting .109 (5 for 46) with two doubles in 13 games. Neither he nor Drew Butera (.190) provided much offense in the absence of starter A.J. Ellis, but Butera is out of options. Ellis, who underwent arthroscopic surgery on his left knee April 7, is expected back in mid-May. 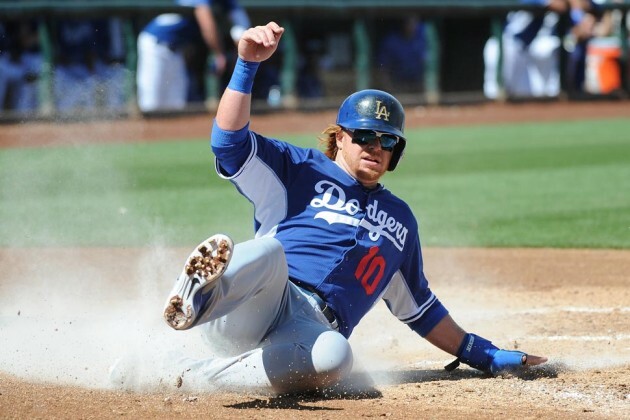 Selection Sunday: Dodgers add Justin Turner to 40-man roster, place Onelki Garcia on 60-day disabled list. The Dodgers selected the contract of Justin Turner on Sunday, adding him to their 40-man roster in advance of their flight to Sydney, Australia tonight. In a corresponding move, the Dodgers placed Onelki Garcia on the 60-day disabled list. Turner signed a minor-league contract with the Dodgers with an invitation to spring training and subsequently batted .333/.432/.467 while seeing time at all four infield positions. Garcia hasn’t pitched at all since undergoing surgery on his left elbow in November. A 60-day disabled list stay means that Garcia won’t appear in a game before May 27. He was a longshot to make the major-league roster if healthy, and will likely be sent to the minors once he’s ready. In a pair of expected moves, catcher Miguel Olivo was reassigned to the Dodgers’ minor-league camp one day after requesting his release, and infielder Erisbel Arruebarrena was optioned to the minor-league camp. The moves help narrow down the list of 30 players the Dodgers are bringing to Sydney, Australia. Pregame notes: Which Dodgers are on the plane, plus lineups for the Cactus League closer. GLENDALE, Ariz. — The Dodgers have about 12 hours before their plane departs for Sydney, Australia and their 30-man travel roster is mostly set. Here’s the latest on a few players who were on the bubble going into today’s final Cactus League game against the Colorado Rockies at Camelback Ranch. Brandon League. “The biggest thing for us with Brandon is it’s the best thing for him to pitch over on that (minor-league) side,” manager Don Mattingly said, but he wouldn’t confirm that League is staying behind. Sounds like League is an insurance policy in case any pitchers (particularly right-handed relievers) sustain an injury today. Justin Turner and Mike Baxter. Their numbers (Turner is batting .333/.432/.467, Baxter .286/.316/.343) and versatility left little doubt that they would make the trip. I thought I’d throw them on the list in case there was any confusion. Chris Withrow. He wasn’t really in danger of being left off the plane either, despite walking seven batters and allowing four runs in five Cactus League appearances. Withrow’s value as a right-handed set-up man goes up if League finds himself working minor-league games the next 10 days. Since he has two options left on his contract, the Dodgers could have optioned Withrow to their minor-league camp. They might still do that after they land in Sydney, but by bringing Withrow the Dodgers have some additional bullpen flexibility for their first two games. Carl Crawford. His fiancee didn’t give birth last night, so Crawford will not be on the plane. Mattingly said that the team will be able to place Crawford on the paternity leave list, so the Dodgers won’t have to burn a 25-man roster spot, or one of their three “exempt” roster spots, while Crawford plays minor-league games in Phoenix. Matt Kemp, Zack Greinke, Dan Haren, Josh Beckett. We knew that already. Mattingly talked about the plan for Kemp this morning; he and Crawford will form a mini minor-league Murderer’s Row while their teammates play overseas. Greinke, Haren and Beckett will pitch some minor-league games in Arizona too. Miguel Olivo. The catcher confirmed an MLB.com report that he asked for his release yesterday after being told that he won’t make the Sydney trip. The Dodgers had three healthy catchers on their 40-man roster in A.J. Ellis, Tim Federowicz and Drew Butera. They’re apparently comfortable with that trio, even if one of them gets injured in the final Cactus League game today. Ellis is starting and all four catchers in camp — including Olivo — are listed on the active roster for the 1 p.m. game against the Colorado Rockies. Dodgers 5, Texas Rangers 5: ‘Starters’ Paul Maholm and Seth Rosin star in another tie game. 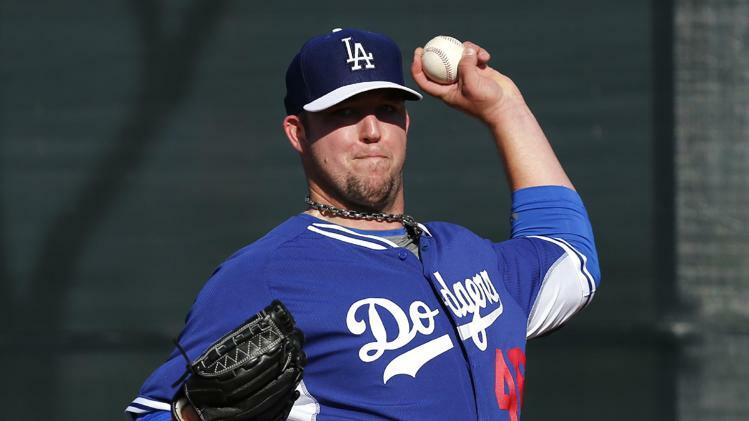 SURPRISE, Ariz. — Based on how they’ve been used in the past and how they’ve pitched in spring training, Paul Maholm and Seth Rosin could both be in a major-league rotation this season. Yet if either pitcher makes the Dodgers’ Opening Day roster, it will probably be as a reliever. That’s simply a function of where the numbers are right now; the Dodgers began camp with five healthy starters on guaranteed major-league contracts before bringing in Maholm and Rosin. Zack Greinke‘s mild calf injury aside, that hasn’t changed. The 31-year-old Maholm has been a starter for his entire career, and he started Saturday. 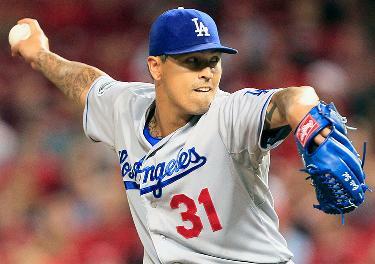 He threw more than 50 pitches — 41 in the first three innings of the Dodgers’ 5-5 against the Texas Rangers and another “12 or so” in the bullpen. Rosin is on a starter’s program too. The 25-year-old right-hander threw three innings (4, 5 and 6) while allowing only one unearned run before an announced crowd of 8,153 at Surprise Stadium. His third Cactus League appearance was easily his worst so far. He struggled with command, walking a batter and throwing a wild pitch, and also balked runners to second and third base in the fifth inning. But he left the game with the Dodgers ahead 3-2. Rosin still hasn’t allowed an earned run in eight spring innings. He’s struck out 10 batters in eight innings and allowed only five hits. “These guys are both being built as starters and right now that’s where we’re at,” Mattingly said, after declining to comment on the possibility that either would begin the season in the bullpen. 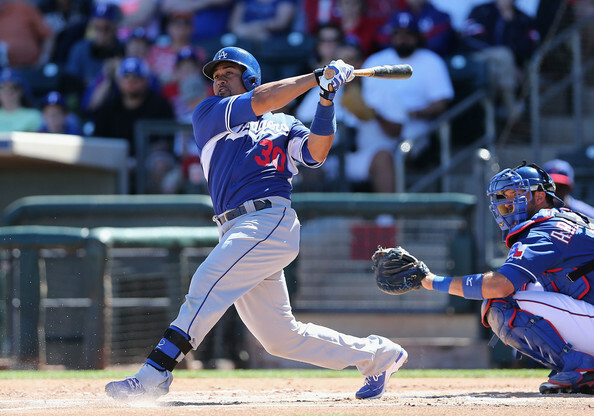 Dodgers sign free-agent catcher Miguel Olivo, invite Joc Pederson to spring training. The Dodgers bulked up their major-league spring training roster Tuesday with one veteran and a swarm of prospects. 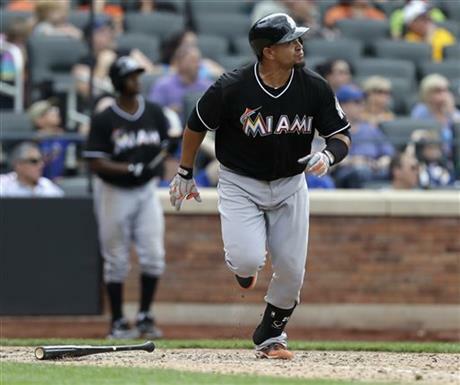 Free agent catcher Miguel Olivo, 35, signed a minor-league contract with an invitation to major league spring training. Olivo batted .203/.250/.392 for the Miami Marlins last year before leaving the team in June. More recently Olivo batted .198/.289/.314 in 26 games in the Dominican Winter League. The 12-year major league veteran immediately becomes the most experienced backstop in camp. Only three catchers are currently on the Dodgers’ 40-man roster: A.J. Ellis, Tim Federowicz and Drew Butera.